Different designs, many different colours - all beautiful! This chandelier can be ordered with up to 15 lamps, of any of the candle lamps and in any colour. 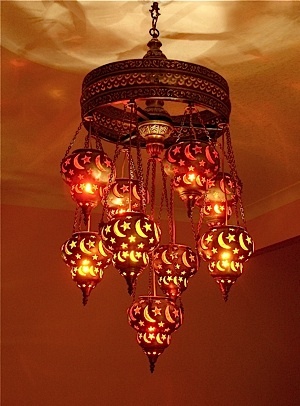 Shown here as the nine lamp version with a mixture of red and amber Sultanahmet lamps. 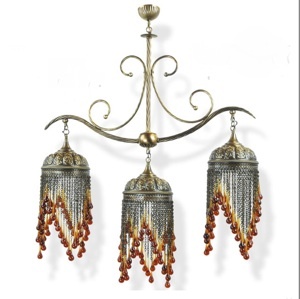 Truly spectacular, requiring great ceiling height, this chandelier would make a dramatic statement in an entrance hal or over a dining tablel. Price: According to style and number of lamps, call for an estimate. The full effect of this chandelier is only experienced when the fixture is lit. Unfortunately it's almost impossible to get a good photograph. 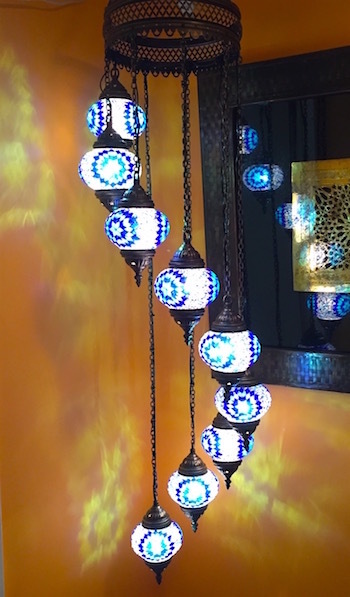 The sparkle of light from the different brightly coloured glass mosaic patterns is truly enchanting. Many other larger designs are also available, please contact us for alternate sizes, designs and prices. Size as shown: Width 40 cms, length 112 cms, adjustable. An elegant curtain of antique brass chains, each of which suspends an elongated glass "teardrop" forms the lamps of this chandelier. Available with either ruby or amber glass drops, and in a choice of two sizes. Click on the photo to see the single trardrop lantern. 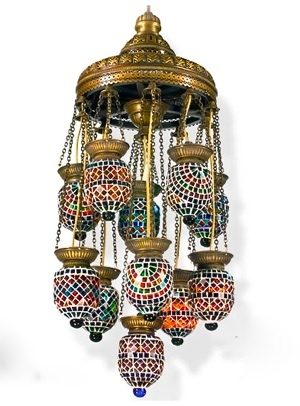 A spiral of nine beaded mosaic globes light this chandelier. This fixture requires a very high ceiling, or can be hung in a corner location to enjoy maximum effect. Available now only in blue, as shown, or red. A three lamp spiral is also available in a choice of colours.